Anna University has announced the November December 2014 Results for UG. Affiliated Institutions: - Nov. /Dec. 2014 Examination Results (Other than PG R2013 and R2001) is Published. Colleges can apply for Photocopy. Last Date for Students is 31-01-2015 and for the College is 03-02-2015. The Web Portal will be closed by 06:00 pm on 03-02-2015. (No further Extension will be given). Web portal is opened for Applying Photocopy of Answer Scripts. Please confirm the Subject before applying Photocopy. 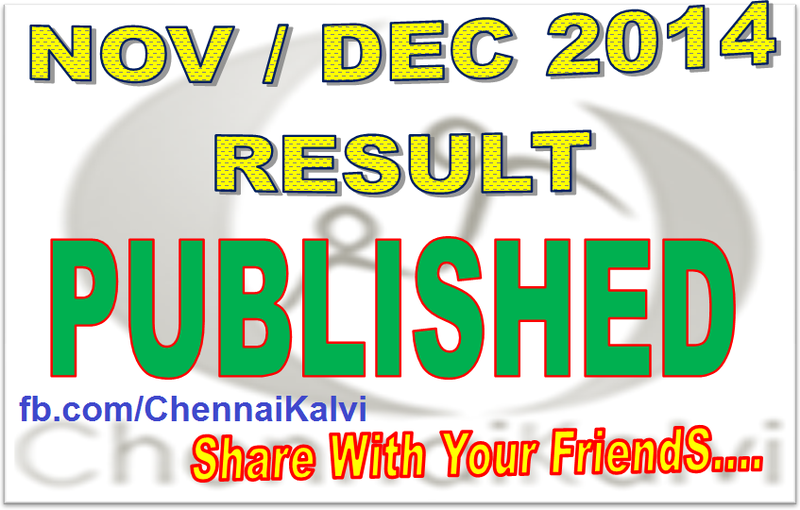 RESULT FIRST AT CHENNAIKALVI.COM. SHARE WITH YOUR FRIENDS.